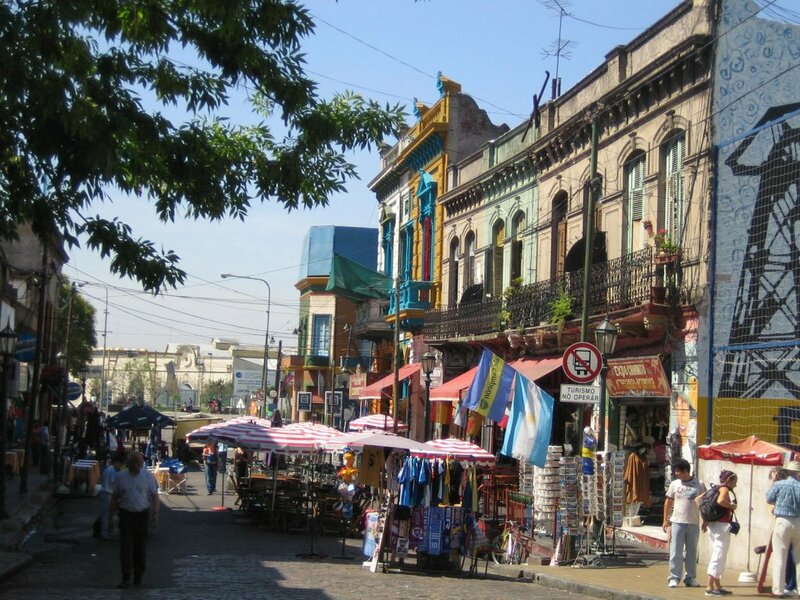 Buenos Aires is a small town - geographically. It's only 77 square miles. About a fifth the size of Houston and about double the size of some towns you may have heard of such as Paris, France and Livonia, Michigan. 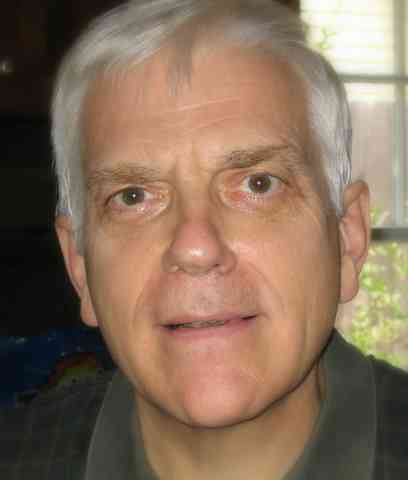 (OK, if you're lucky, you know one of those towns well and have never been to the other.) Buenos Aires holds 2.8 Million people who tend to live most of their lives in their original neighborhoods, called barrios. 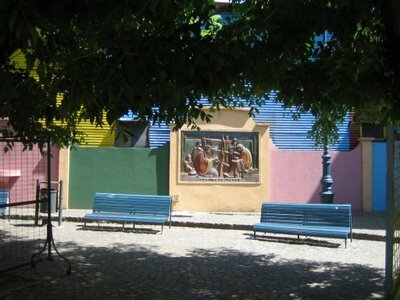 BA has 47 of them and many of the colorful and historic barrios are within 1 or 2 miles of Plaza de Mayo. Here's some photos from our Saturday morning visit to the most colorful of them all: La Boca. 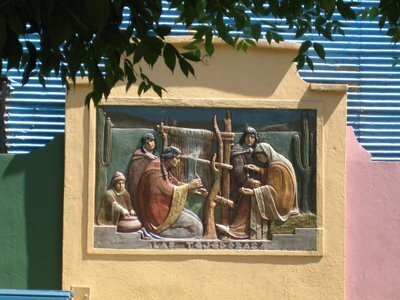 La Boca is Spanish for "the mouth," as it was at the mouth of the Riachuelo River that most of the city's early settlers landed. Even today, Buenos Aires inhabitants, regardless of neighborhood, call themselves Porteños - people of the port. On the Southwest side, La Boca was the port area before the port silted up. 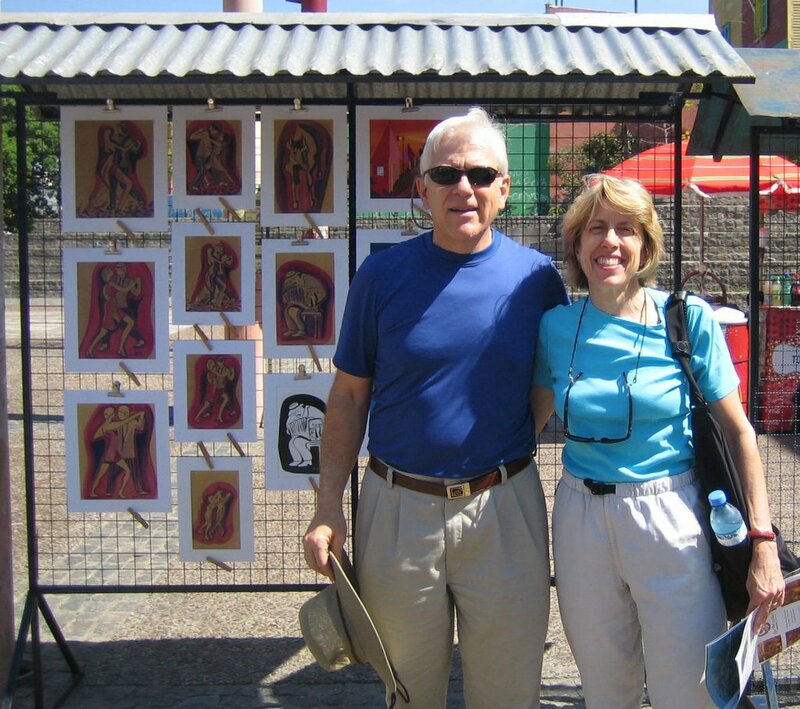 Many of its inhabitants trace their roots back to another port city, Genoa, Italy. 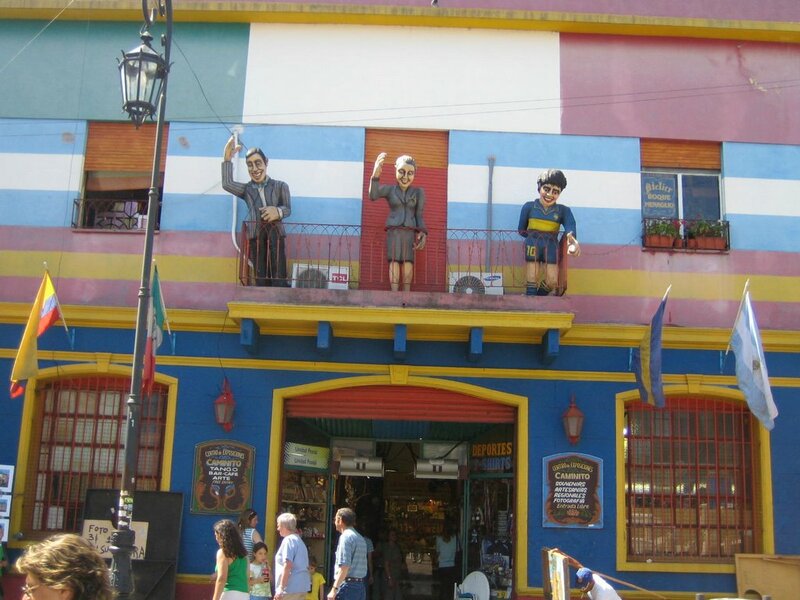 In 1882, La Boca briefly "seceded" from Argentina and raised the Genoese flag until President Roca (remember that Bariloche guy!) personally tore it down. Nothing like a hands-on president. (If this seems too far-fetched, remember that Sicily thought it was going to become the 49th state of the US after WWII. After all, NYC is 700 miles closer to Italy than it is to Honolulu.) La Boca still retains its Italian flavor (in fact, about half of the European immigrants who flooded into the affluent Argentina of 1880-1920 came from Italy). 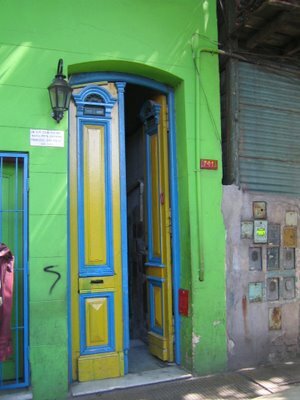 Today La Boca is an artists colony/tourist trap by day and a tough neighborhood at night. 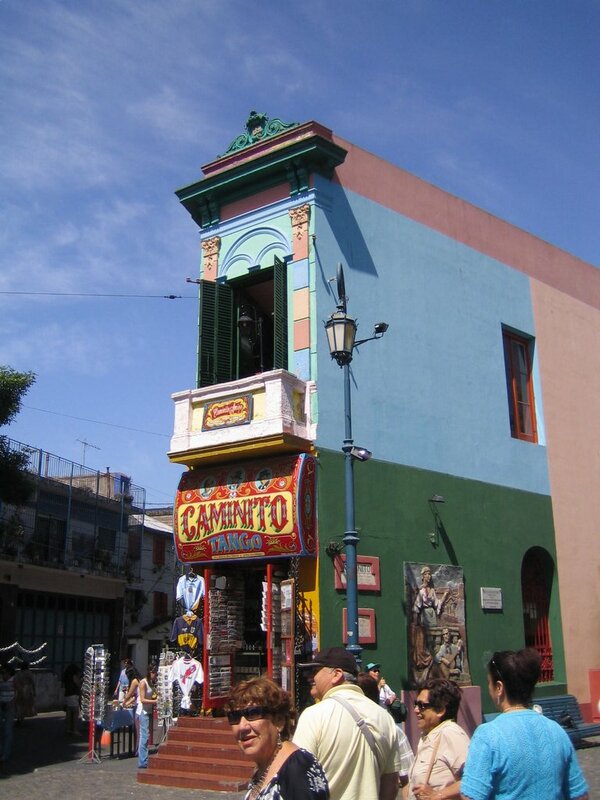 Brightly painted shops, museums, and tenement houses line its main street Caminito, itself named for a tango song. The story goes that residents built using industrial scraps like corrugated zinc sheets from the nearby port and brightened the structures up with paint left over from the ships - hence the mélange of colors. 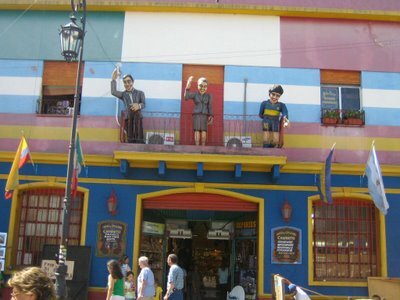 The volunteer fireman have had a history as colorful as La Boca's buildings. Chartered in 1884, they were forbidden to put out fires five years later by President Celman who was himself overruled by a successor. 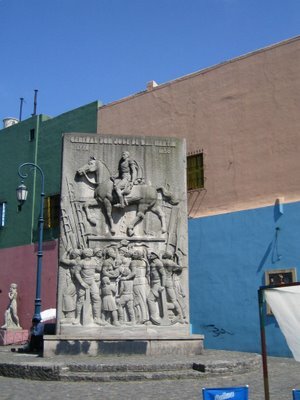 Besides fires, the volunteers performed admirably during the yellow fever outbreak and the periodic flooding of the Riachulo river. (They do a heck-of-a-job.) Today the fireman have the statue in a square dedicated to them at Lamadrid and Garibaldi Streets. 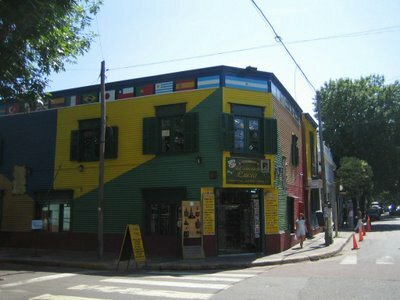 La Boca is also famous for inventing the tango and has several active tango clubs. Most soccer fans know of it as home to great Boca Junior Athletic Club founded in 1905. 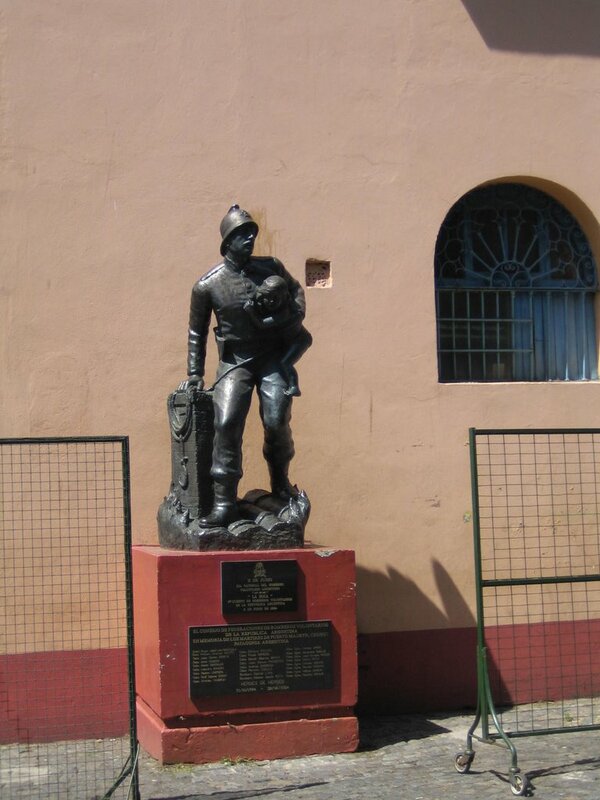 Today they play in a 1940 stadium nicknamed "la Bombonera" since its floors resemble a box of chocolates. it and its more secure.